Hello readers. 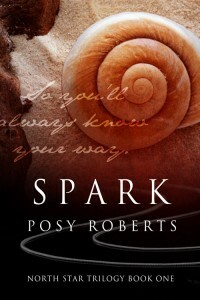 I’m Posy Roberts, and I’m here to celebrate the release of my book Spark, which is released today, September 2nd. It’s the first book in my North Star trilogy. Here’s the blurb to give you a taste of what the story is about. I never in my wildest dreams thought I’d write a trilogy. They seemed too big and too involved. With the amount of notes I have scattered around my writing studio, stuck to my computer monitor, and tucked away in journals, I was right about them being very involved. When I first started talking about this story with my friend who actually inspired it, I quickly realized there was no way I could tell it in just one book unless I wanted it to be mammoth. The entire trilogy covers two time periods in Hugo Thorson and Kevin Magnus’s lives and several years. Spark deals with both time periods—high school and adulthood—and covers about two months of modern day. The rest of the trilogy is modern day. I’m so excited I’m finally able to share this story. I wrote it in the summer of 2012, so it seems like I’ve known Hugo and Kevin for ages. Of course, they’re very new to you. I quickly found out that writing over three books allowed me to leave unfinished threads drifting in the breeze that I could easily pick up again and start weaving into the next book. That was fun. There are issues I introduce in Spark that aren’t even discussed again, let alone resolved, until book three. In many ways, that was like a treasure hunt for me as I wrote. That’s also why there were (still are, actually) so many notes all over my house. But it was fun, and I’m glad I took up the challenge. Today I’ll be celebrating the release of Spark here on the Dreamspinner Press blog. I’m going to writing about what inspired the cover art, what it was like to essentially write two love stories in one book, discuss some of the images that inspired me along the way, and also what it was like to write about some sensitive topics. There will be several excerpts from the book, and if technology is on my side, I will share some clips of a few readings from Spark as well. I’d love it if you could stick around and help me celebrate. But first, since this is a story about having a second chance at love, I’d love to hear from you. Have you had or wish you’d had another chance with someone you once loved? I’d love to hear about it. As a bonus for sharing, I’ll enter you in a drawing for one of three free eBook copies of Spark. Congratulations on the release of Spark I hope you have a fabulous release party. I love stories with second chances in because I had a second chance in my life so that is always a theme that resonates with me. I had some issues to work through when I was younger that resulted in me ending a relationship with my then-boyfriend (I know it’s a cliche but it wasn’t him, it was me iyswim!). But after some time apart I realised I still loved him and that I wanted to try and make it work with him. I was very fortunate that he was brave enough to give me another chance and fifteen years on we’re still together. I hope we’ll have many more years together. Oh, I love stories like that, Jay. They make me so happy. I have a few friends that this happened to as well. The only time I gave a guy a second chance ended in disaster, but I was very young. I was always better with the friends-to-lovers option. From reading, it sounds like the other 2 books are already written and I have 2 questions: does the first end with a cliffhanger and when will the other 2 be released? I’m looking forward to reading them all but hate cliffhangers and wonder if I should wait. Hi Andrea. Yes, the other two books have indeed been written. Fusion, book 2, is expected sometime in November, and Flare, book 3, is expected February-ish. Not sure on the exact dates since that depends on many things. Cliffhangers, no, especially if you were thinking those horrid ones that make you shake until the next book comes out. I don’t do anything like that. That’s not to say that there aren’t parts of the story left unresolved, but nothing that will make you lose sleep. I absolutely love stories about sweethearts reunited and second chances at true love (especially with complications and bumps in the road). I absolutely love the man I married, sometimes I wonder “what if…?” about certain old flames–or one old flame in particular. Although in a way, my hubby and I are old flames… we met, dated, drifted, got involved with other people, had relationships crumble, got back together, drifted again–because I’m an idiot–got back together again and finally got married–because I stopped being an idiot! Thanks so much for your answer about whether or not it has a cliffhanger. I pre-ordered Spark and now I can read it without that little bit of dread. You described that feeling perfectly. Regarding 2nd chances, let’s just say I did and it didn’t work out at all. My second chance didn’t work out either, Andrea. Haha, HB. I doubt you were an idiot. Your heart must’ve just been worried about something. I’ve had those what if moments too, but only because I wonder what would’ve happened. In the end, I’m more than happy with my husband. We’ve been together for over 20 years, so I guess it worked out for me. My husband and I have known each other for 20 years–and believe me, if you’d met my second husband, you’d agree that I was an idiot But on the upside, I got a wonderful daughter out of that marriage, so I guess it worked out in the end. Oh, I definitely get that, Trix. I think that’s more how I feel too, about the ones I never got to know. Same with the romances that were interrupted by something. That’s what happens to Kevin and Hugo. College interrupts them. They never break up, but their romance fizzles because of life and distance. Then they get a second chance! That’s exciting to me. I absolutely love the cover (someday I want an Anne Cain cover of my own). Haha. Look what I just posted. Cover Inspiration. I love second chance at love stories. I’ve sometimes wonder about possibilities but think sometimes things happen for a reason and never know if life would have turned out better. The cover is so beautiful with the seashell and sand etc. Thanks. I love the cover too. I wonder about fate too. If it weren’t for fate stepping in and making some pretty drastic changes in my life, I never would’ve ended up with my husband. I haven’t gotten any second chances nor given any, so I can’t really say. This book sounds interesting. I’d love to read it. I’ve had one, and I wish I hadn’t had it. Haha. What an undertaking! I always marvel when an author can write one book but a trilogy requires so much forethought! Congrats on this new beginning! It was really more about the story not fitting in one book. I had too many plot twists and turn to put into one book too, at least without making readers dizzy. And thanks for the well wishes. I’m very excited. At this point I’m really still hoping for a first chance…. This books sounds like the kind of story I love! The guy I gave a second (and third – hey I was young) chance too did not work out. But the silver lining was that after the third strike I gave my friend-who-wanted-to-be-more a chance, married him and we now have two wonderful kids. I married my friend too. It worked out wonderfully for me too!